Elizabeth waves from the cockpit of "Revival"
Our guest author, Elizabeth Pagano, co-founder of yourSABBATICAL’s, a company that helps employers develop sabbaticals, offers helpful information for individuals and companies interested in sabbaticals in this post. Grab some coffee, sit down and enjoy this short introduction to the world of sabbaticals. Then take some time to explore yourSABBATICAL. I found some great information at her site that is helping us plan our next mini-sabbatical–actually our 2010 four-week “vacation,” but I like the sound of “mini-sabbatical” better! My sabbatical was spent with my mother sailing a small sailboat for six months. 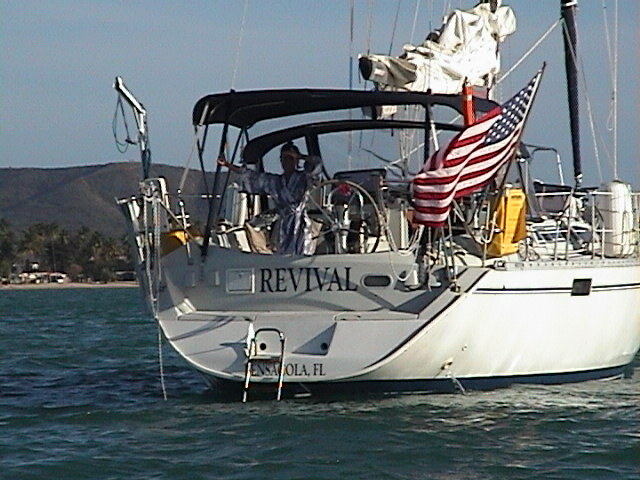 We left after 9/11 and navigated 2,000 miles from Pensacola, FL, to the Northern Antilles. It was just the two of us. The time away from land life had a significant impact both on us as individuals and on our relationship. And it was the foundation for our business partnership. Already in business together in leadership development consulting, we became intensely curious about what was being done in corporate America to provide sabbatical opportunities to employees. How can others experience the benefits of a significant block of time away – not just a vacation – and, if businesses also benefitted, perhaps they would support employees in this meaningful, holistic way. Thus began our work and research, which has been recognized by The Conference Board as a model for the future. Sabbaticals began in the ministry, of course, followed by academia in the early 20th century as a way to compete for talent with industry. They’re not an entirely new concept in the business world – they were first offered in the 1960s by McDonald’s and have been a fairly common offering in the technology sector since the 1970s, starting with Intel. Our mission at yourSABBATICAL.com is to make sabbaticals a part of every career ladder and a component of the new way of working. Instead of putting off a meaningful break until retirement, why not retire a few years later and use that extra time to experience sabbaticals at regular intervals throughout a career? In addition to working with companies to create sustainable sabbatical programs for their employees, our team works with individuals to design sabbaticals that truly help them step up in their careers – not just step out. Through enlightening assessment tools and insightful evaluation, we can guide you through all phases of a successful career sabbatical, from negotiating a leave and planning your work coverage to integrating your sabbatical experience into your leadership practices and personal brand. Thank you, Susan! I appreciate all that you’re doing to spread the word about sabbaticals. The corporate world has so much to learn from this long-held tradition in ministry. You are welcome. I’m excited to recommend your website to those investigating a personal sabbatical. You have much to offer.